Pritchard (1949) refers to Tenuipalpus pacificus Baker as the phalaenopsis mite. This flat red mite is one of the most destructive found on orchids under Florida greenhouse conditions. It feeds on the leaves of orchids but does not spin a web. Apparently it is an introduced species on orchids from the tropics. It can also be a pest of ferns. Figure 1. Adult female Tenuipalpus pacificus Baker. Tenuipalpus pacificus was described from specimens intercepted at Hoboken, New Jersey, from the Canal Zone on Phalaenopsis stuartiana in 1943 (Baker). The known distribution is: Australia (New South Wales) (CSIRO 2004), Brazil (De Moraes and Freire 2001), England, Germany, Holland, Java, Panama, Philippines, Siam, South Africa, and the United States. In the United States, it has been recorded in California, Hawaii (Anonymous 2002), and Florida. It is probably found wherever orchids have been imported directly from South and Central America. The length of the adult female, including the rostrum, is 312 microns and 190 microns wide. The third, terminal, palpal segment is small with one short, straight seta and one longer slightly curved seta. These characters cannot be seen on unmounted specimens. 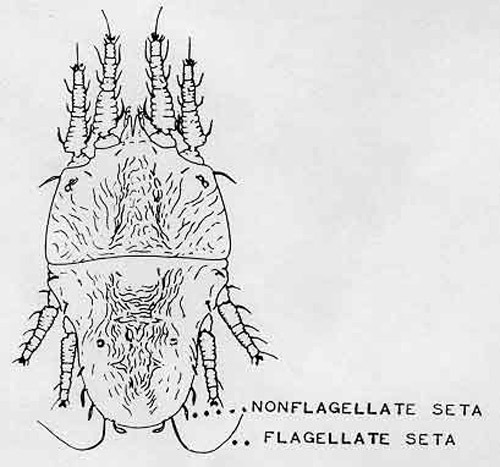 The hysterosoma has four pairs of nonflagellate setae and one pair of flagellate setae caudally. The length of the adult male, including the rostrum, is 269 microns and 150 microns wide, and has the same general appearance as the female, except smaller and narrower. Figure 2. Adult female phalaenopsis mite, Tenuipalpus pacificus Baker. Illustration by Division of Plant Industry. Figure 3. Gnathosoma with palpi of the phalaenopsis mite, Tenuipalpus pacificus Baker. Illustration by Division of Plant Industry. Figure 4. Adult male phalaenopsis mite, Tenuipalpus pacificus Baker. Illustration by Division of Plant Industry. Elongate reddish eggs are laid on the surface of the leaf, usually along the midrib. The eggs hatch in about three weeks into the larval stage which has three pairs of legs. All other stages have four pairs of legs. The larva molts into the protonymph in about two weeks. 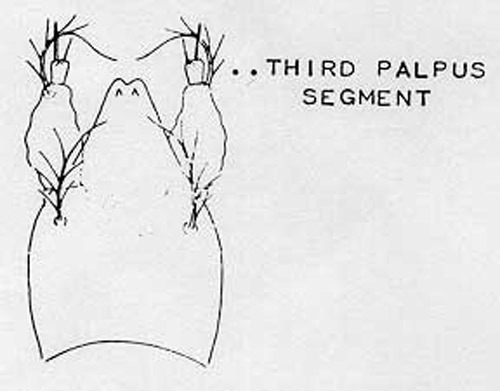 The protonymph molts into the deutonymph in about two weeks and to the adult stage in about two weeks, according to Dosse (1954). The life cycle spans approximately two months depending on the temperature and humidity. There are several generations per year. This mite is host specific to the Orchidaceae and Polypodiaceae plant families. Known hosts of Orchidaceae: Aerides, Cattleya, Cypripedium, Dendrobium, Grammatophyllum, Oncidium, Phalaenopsis and Saccolabium. Known hosts of Polypodiaceae: Davallia fejeensis and Platycerium sp. 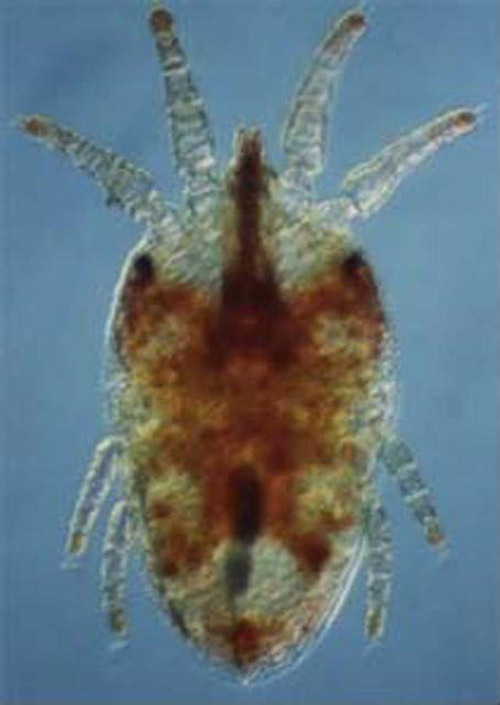 Many of the false spider mites are polyphagous, but Tenuipalpus pacificus is restricted to Orchidaceae and Polypodiaceae. This mite has needle-like, cheliceral stylets that pierce the epidermis and remove chlorophyll, causing the plant tissue to become silvery in appearance and later to turn rusty brown. The white molted skins remain on the leaf, conspicuous against the rusty-brown leaf. 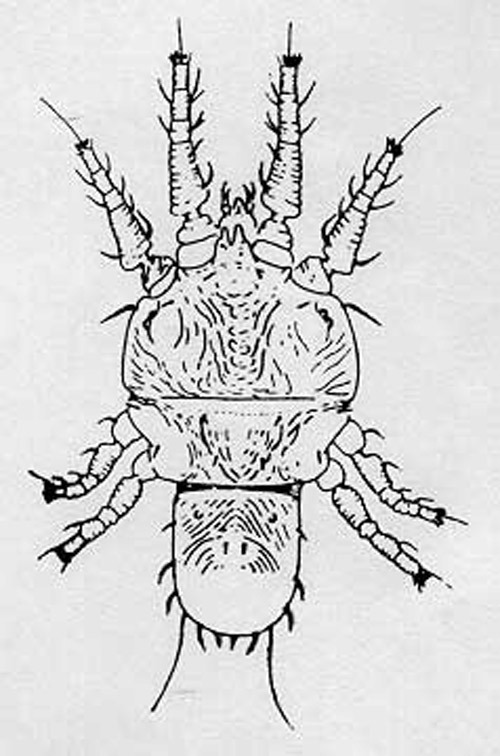 The mite feeds and breeds on both sides of the leaf, but prefers the lower surface. CSIRO. (September 2004). Tenuipalpus pacificus Baker. CSIRO Entomology (9 October 2018). Pritchard AE. 1949. California greenhouse pests and their control. California Agricultural Experiment Station Bulletin 713: 1-71. Pritchard AE, Baker EW. 1952. The false spider mites of California (Acarina: Phytoptipalpidae). University of California Publications Entomology. 9: 1-93. Originally published as DPI Entomology Circular 74. Distribution updated for this publication. Publication Date: October 2006. Latest revision: October 2018.